Here, we describe a method for isolation, culture and manipulation of mouse embryonic pancreas. This represents an excellent ex vivo system for studying various aspects of pancreatic development, including morphogenesis, differentiation and growth. Pancreatic bud explants can be cultured for several days and used in a range of different applications, including whole-mount immunofluorescence and live imaging. Petzold, K. M., Spagnoli, F. M. A System for ex vivo Culturing of Embryonic Pancreas. J. Vis. Exp. (66), e3979, doi:10.3791/3979 (2012). The pancreas controls vital functions of our body, including the production of digestive enzymes and regulation of blood sugar levels1. Although in the past decade many studies have contributed to a solid foundation for understanding pancreatic organogenesis, important gaps persist in our knowledge of early pancreas formation2. A complete understanding of these early events will provide insight into the development of this organ, but also into incurable diseases that target the pancreas, such as diabetes or pancreatic cancer. Finally, this information will generate a blueprint for developing cell-replacement therapies in the context of diabetes. During embryogenesis, the pancreas originates from distinct embryonic outgrowths of the dorsal and ventral foregut endoderm at embryonic day (E) 9.5 in the mouse embryo3,4. Both outgrowths evaginate into the surrounding mesenchyme as solid epithelial buds, which undergo proliferation, branching and differentiation to generate a fully mature organ2,5,6. Recent evidences have suggested that growth and differentiation of pancreatic cell lineages, including the insulin-producing β-cells, depends on proper tissue-architecture, epithelial remodeling and cell positioning within the branching pancreatic epithelium7,8. However, how branching morphogenesis occurs and is coordinated with proliferation and differentiation in the pancreas is largely unknown. This is in part due to the fact that current knowledge about these developmental processes has relied almost exclusively on analysis of fixed specimens, while morphogenetic events are highly dynamic. 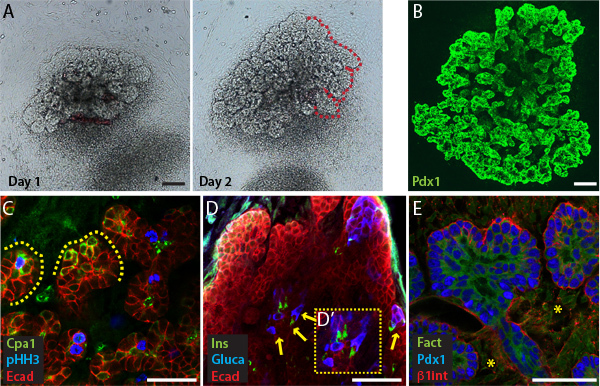 Here, we report a method for dissecting and culturing mouse embryonic pancreatic buds ex vivo on glass bottom dishes, which allow direct visualization of the developing pancreas (Figure 1). This culture system is ideally devised for confocal laser scanning microscopy and, in particular, live-cell imaging. Pancreatic explants can be prepared not only from wild-type mouse embryos, but also from genetically engineered mouse strains (e.g. transgenic or knockout), allowing real-time studies of mutant phenotypes. Moreover, this ex vivo culture system is valuable to study the effects of chemical compounds on pancreatic development, enabling to obtain quantitative data about proliferation and growth, elongation, branching, tubulogenesis and differentiation. In conclusion, the development of an ex vivo pancreatic explant culture method combined with high-resolution imaging provides a strong platform for observing morphogenetic and differentiation events as they occur within the developing mouse embryo. The protocol described here has been adapted from the technique originally described in Percival and Slack9 and optimized for confocal microscopy. The following steps should be carried out under sterile conditions in a laminar flow hood. Pancreatic explants are cultured in 35-mm Petri dishes with 20-mm diameter glass microwell bottom (e.g. MatTek Corporation). Use one glass bottom dish per explant culture and for the whole duration of the culture. On the day before the dissection and isolation of the pancreatic buds, coat the glass bottom microwells with fibronectin. Dilute sterile fibronectin in cell culture-grade water to a 50 μg/ml final concentration and add a minimum volume of it (~150 μl) into the 20-mm microwell of the MatTek plates covering the whole glass surface (Figure 1E). Place the dishes in a 4 °C refrigerator for overnight incubation. On the day of the dissection, aspirate the fibronectin, rinse the microwell with cell culture-grade water and add a minimum volume of 150 μl of BME (Basal Medium Eagle) medium supplemented with Pen/Strep (1%), Glutamine (1%) and 50 μg/ml Gentamicin [Dissection Medium]. Leave the coated dishes in the laminar flow hood until ready to plate the explants. If not all fibronectin-coated dishes are used, they can be stored for up to 1 week at 4 °C. Do not let the dishes dry, fill them with Dissection Medium and place them in the refrigerator. In addition to fibronectin, pancreatic explants have been successfully cultured on various substrates, such as laminin9, matrigel10,11 or microporous membranes12. Because of its effects on branching, we use fibronectin9 as substrate. Timed-pregnant female mice at embryonic day (E) 11.5 or 12.5 are sacrificed and embryos are collected using dissecting instruments previously cleaned with 70% Ethanol. Place the dissected uterus in 10-cm plates containing ice-cold PBS supplemented with 50 μg/ml gentamicin. Under a stereomicroscope with illumination from above, separate the uterus into individual embryo segments using small scissors or Dumont forceps, gently peel away the muscle of the uterus and remove the individual embryos, which are surrounded by the decidua. Use standard embryo dissection techniques13 to expose the embryos and remove the yolk sac and amnion. Subsequently, remove the upper body of the embryo (above the liver) and the tail region. This will allow exposure of inner organs (Figure 1B). Transfer the mid-body of the embryos into 10-cm plates containing ice-cold BME dissection medium. Now use only transillumination from below to visualize and to dissect the dorsal pancreatic bud under the stereomicroscope. Gently, open the mid-body of the embryo by making a lateral incision with forceps. Locate the stomach and the spleen. The dorsal pancreatic bud is attached laterally to the posterior region of the stomach (Figure 1C). Using Dumont forceps, dissect away the dorsal pancreatic bud from adjacent structures, such as the stomach and the spleen, but leaving some mesenchyme around the epithelium (Figure 1D). Using a glass Pasteur pipette, transfer the isolated bud into a 35-mm Petri dish containing cold BME dissection medium supplemented with 10% fetal calf serum [Culture Medium]. Repeat these steps until all pancreata are isolated. If pancreata of different genotypes are isolated, keep them separate using Nunc 4-well plates. Final plating of the explants is carried out in tissue culture room and/or in close proximity to the tissue culture incubator to minimize physical movement of the cultures. Under sterile conditions in a laminar flow hood replace the BME Dissection Medium in the fibronectin-coated MatTek dishes with ~150 μl of BME culture medium pre-warmed at 37 °C. Carefully, transfer the pancreatic explants into coated MatTek dishes (one explant per dish) for long-term culture using a glass Pasteur pipette. To ensure spreading during culture, the mesenchyme surrounding the explants can be slightly ripped, if necessary, with a fine needle. Gently, place the cultures in a tissue culture incubator (37 °C; 5% CO2) for few hours to let the explants attach to the glass bottom microwells. Once they are attached, fill up the MatTek dishes with 1.5 ml to 2 ml of BME culture medium pre-warmed at 37 °C. The day of dissection is referred to as day 0. Manipulation of the pancreatic explant cultures is carried out under sterile conditions in a laminar flow hood. The BME culture medium is changed every other day, unless experimental requirements dictate different timing (e.g. incubation of explants with chemical agents). The explants can be cultured in this condition for 5 days up to one week. All steps of the immunofluorescence protocol (from fixation to imaging) are carried out in the same MatTek dish, which yields better images than a plastic-bottomed dish. After fixation, pancreatic explant cultures do not need to be kept under sterile conditions. Aspirate BME culture medium and wash the explant once with 2 ml 1X PBS. For explant fixation replace PBS with 2 ml ice-cold 4% paraformaldehyde (PFA) and place the dish on ice for 20 min. Swirl the plate gently from time to time, but avoid rocking platforms, as the explant might detach. Remove PFA and wash the explant three times with 2 ml of 1X PBS for 10 min each at room temperature (RT). Block with 2 ml blocking solution (1X PBS + 0.1% Triton-X + 3% Donkey Serum) for at least 30 min at RT. Dilute primary antibody in blocking solution and add ~150 μl of the dilution directly into the 20-mm microwell of the MatTek plates covering the whole explant surface for overnight incubation at 4 °C. To minimize physical movements, add primary antibody to the explants directly in the cold room (4 °C). To prevent evaporation, before adding the antibody, place the MatTek plates in a humid chamber. The next day remove the antibody solution and wash three times with 2 ml 1X PBS + 0.1 % Tween-20 (PBT) for 30 min each at RT. Dilute secondary antibody in blocking solution [according to manufacturer's recommendations; we use donkey Alexa Fluor dyes secondary antibodies at 1:750 dilution] and add ~150 μl of the dilution directly into the 20-mm microwell of the MatTek plates, covering the whole explant surface, for 1-2 hr incubation at RT in the dark. For nuclear counterstaining, include Hoechst together with secondary antibody dilution. To prevent evaporation, before adding the antibody, place the MatTek plates in a humid chamber. Wash three times with 2 ml 1X PBS + 0.1 % Tween-20 (PBT) for 30 min each at RT. Before mounting, wash once with 1X PBS to remove Tween-20. Mount by adding one drop of aqueous mounting medium (with anti-fading) into the 20-mm microwell of the MatTek plates. Gently, cover the explant with a glass coverslip. Avoid air bubbles. Explants on MatTek plates can be viewed under standard phase contrast microscopy or confocal microscopy, depending on the goals of the experiment. For confocal microscopy analysis we use a Zeiss LSM 700 inverted setting. Set up appropriate lasers for fluorophores used. Select an objective that will image the desired area of the pancreatic explant. A 10X water-immersion objective is suitable to keep the entire explant in the field of view. A 40X water- or oil-immersion objectives are suitable to focus on specific regions of the pancreatic explant with greater resolution. The explants can be optically sectioned and then the acquired Z-stacks reconstructed in 3D, using appropriate software. Environmental chamber setup: use an environmental enclosure and a small incubation chamber [with temperature and CO2 control] that sits on the microscope stage. Proper culturing of the embryonic pancreas requires a stable temperature of 37 °C and a controlled atmosphere of humidified 5% CO2. Suitable chambers are available from several vendors (e.g., Zeiss, Nikon, Olympus). Assemble the heater box and turn it on at least 1 hr before imaging starts to allow the equipment to warm up and equilibrate CO2 content to 5%. For time-lapse imaging of pancreatic explant cultures, we use a Zeiss LSM 700 inverted microscope. For lasers and objective selection see point 4.10. Let the pancreatic explant attach well to the glass-bottom dish before starting the live imaging. [We usually perform live imaging starting on Day 1]. In a laminar flow hood, aspirate and replace the explant medium with fresh BME culture medium to start with optimal nutrient conditions. Gently transfer the explants to the microscope room and place the MatTek dish in the incubation chamber into the specimen holder of the confocal microscope. Prepare the objective (e.g. add oil or water-medium according to the choice of immersion objective) and focus on the region of interest in the explant. Close the environmental chamber properly. To prevent evaporation during time-lapse acquisition with water-immersion objectives, in place of water it is recommended to use viscous immersion fluids that are commercially available (e.g. Zeiss Immersol W). Set up laser intensity, Z-stack acquisition parameters and time interval (see also Discussion for Troubleshooting). Start the experiment. After imaging, export Z stacks and all time points and analyze them using appropriate software (e.g. ImageJ, Volocity, Imaris, Huygens). Dorsal pancreatic buds (together with the surrounding mesenchyme) were dissected from mouse embryos between E11.5 and E12.5 and plated directly on glass bottom culture dishes (Figure 1). Blood vessels are present in the mesenchyme surrounding the epithelium and can be visualized by immunostaining for the endothelial marker Pecam12 (data not shown). After two days of culture, pancreatic explants underwent significant growth and started to organize themselves into branched epithelial structures, whose nuclei were positive for the pancreatic transcription factor, Pdx1 (Figure 2A-C). The average z-thickness of pancreatic explants on day 3 of culture is 60-80 μm. The surface and volume of the explants can be measured using appropriate softwares (e.g. Huygens). Morphology and immunofluorescence analyses showed that pancreatic explants cultured using this protocol recapitulated in vivo early pancreatic differentiation and morphogenetic events5,10,11,14 (Figure 2). Pancreatic explants on day 4 of culture underwent typical "tip and trunk" segregation of the epithelium8, displaying cpa1+ progenitor cells at the tips of the epithelial branches (Figure 2C) and differentiated insulin+ and glucagon+ cells organized as clusters inside the trunk (Figure 2D). In addition, the pancreatic epithelium in the ex vivo cultures showed proper cytoskeleton organization and cell polarity, with apical localization of F-actin (Figure 2E, in green) and b1-integrin at the basal membranes (Figure 2E, in red). To study pancreatic branching in realtime,embryonic pancreatic explants were isolated from the dual-color fluorescent reporter mouse strain membrane-Tomato/membrane-Green15 (mT/mG; mouse strain is available at the Jackson Laboratory) (Figure 3). Still frames from a time-lapse movie of mT/mG pancreatic explants grown in culture are shown in Figure 3. The localization of the mT fluorescent protein to membrane structures outlines cell morphology and allows resolution of fine cellular processes, enabling to track cell remodeling and migration over time. After a 12-hr time-lapse experiment the mT fluorescence signal remains viable and detectable, even though its intensity is reduced, most likely due to photodamage (Figure 3). Technical solutions to avoid or reduce photodamage and phototoxicity are discussed in the Discussion section. Figure 1. Schematic representation of the dorsal pancreas bud dissection from E12.5 mouse embryo. (A) Brightfield image of E12.5 mouse embryo. The upper body of the embryo (above the liver) and the tail region are removed to isolate the mid-body (B). Incisions are shown by red dotted lines. (C) Further dissection results in exposure of the stomach and duodenum region (indicated by the dotted box). The dorsal pancreatic bud (see red dotted circle) is at the base of the stomach and next to the spleen primordium. The dissected dorsal pancreatic bud (D) is transferred with a Pasteur pipette into the microwell of a glass bottom dish containing BME culture medium (E, F). Abbreviations: sto (stomach), sp (spleen), dp (dorsal pancreatic bud), duo (duodenum). Scale bars, 1000 μm (A, C). Figure 2. Whole-mount confocal immunofluorescence analysis of pancreatic explant cultures. (A) Brightfield images of pancreatic explants on day 1 and day 2 of ex vivo culture. Red dotted line indicates initiation of branching of the epithelium. (B) 3D reconstruction of whole-mount immunostaining for Pdx1 on day 3 pancreatic culture. Pancreatic explants showed tubules of Pdx1+ cells undergoing extensive branching by 48 hr of cultures. (C) Whole-mount immunostaining of day 3 pancreatic explant with antibodies against the basolateral membrane marker E-cadherin (Ecad), tip progenitor marker, Carboxypeptidase 1 (Cpa1) and phospho-Histone H3 (pHH3). Most of the mitotic active pHH3+ cells colocalize at the peripheral tips with Cpa1+ cells. Dashed lines indicate tip of the branches. (D) Whole-mount immunostaining for endocrine lineage markers, insulin (Ins) and glucagon (Gluca) at day 3. Yellow arrows indicate clusters of Ins+ and Gluca+ cells. Inset (D'), higher-magnification of one of the endocrine cell cluster. (E) Whole-mount immunostaining of day 3 pancreatic explant for Pdx1, β1 integrin (β1int) and F-actin (Fact). Mesenchymal cells (asterisks) interspersed among Pdx1-positive epithelial cells. Images shown in C, D and E are single confocal optical sections of Z-series. Scale bars, 100 μm (A, B); 50 μm (C-E). Figure 3. Representative live-cell imaging of ex vivo cultured pancreatic explant. (A-D) Frames from a time-lapse movie of a pancreatic explant from a mT/mG mouse transgenic embryo. Time of imaging is shown in hours:minutes. The explant was imaged starting at Day 1. Z-stack images were acquired with a 40X oil immersion objective every 12 min for a total of 15 hr. Dashed lines indicate tip of the branches and border between epithelium and mesenchyme. Scale bar, 50 μm. Once pancreatic fate is specified, pancreatic progenitor cells undergo extensive proliferation, differentiation and morphogenesis to eventually form a mature and functional organ2,4. At present, how branching takes place in the pancreas and how it is connected to progenitor proliferation and differentiation is largely unknown. Pancreatic explant cultures represent an ideal system to elucidate these processes ex vivo5,9,11. By combining live-cell imaging with ex vivo explants of early pancreatic buds one can obtain a clear picture of the events that take place during pancreas morphogenesis in the embryo. This video article presents a simple approach to establish ex vivo cultures of embryonic pancreas on a glass support, which makes them ideal for whole-mount immunofluorescence and live imaging. Numerous examples of the use of ex vivo pancreatic explants for imaging cell morphology, growth and differentiation are presented here. Importantly, these examples show that embryonic pancreases cultured ex vivo using this protocol mimic the early stages of in vivo embryonic pancreas development2,3. For example, branching initiates approximately 24 hr after plating of E11.5 pancreas, as expected in vivo (Figure 2A). While morphogenesis and cell differentiation in the cultures closely resembles that seen in vivo, the overall growth of the explants is not comparable and considerably less than that seen in the developing embryo. Under the culture conditions described here, pancreatic explants stop growing at day 5 and undergo degeneration after one week (data not shown). Therefore, the reported ex vivo culturing system is limited and better suited to the investigation of early aspects of pancreas organogenesis. We present here examples of ex vivo cultures that we established from wild-type as well as mT/mG reporter mouse embryos. The use of a fluorescent reporter strain is indispensable for real-time imaging, enabling the visualization of cellular and subcellular structures and the study of their dynamics in a 3D environment. For instance, the localization of the mT fluorescent protein to membrane structures enables us to precisely visualize cell morphology and track cell remodeling and migration over time in the pancreatic explants. One of the most common problem and limitation in live-cell imaging experiments is photodamage that may occur as a result of repeated exposure to fluorescence excitation illumination. In general, one has to balance image quality with the phototoxicity in the context of its own experimental settings. For instance, to minimize photodamage one possibility is to reduce the frequency of imaging and increase the time lapse between consecutive frames or, alternatively, to optimize the Z stack acquisition by reducing the number of optical slices. Finally, ex vivo culturing of embryonic pancreas is a valuable system for screening chemical compounds and their effects on pancreatic development. The compound or factors can be added directly to the culture medium and the developmental effects can be easily assessed under a microscope. Using data analysis software, one could even obtain quantitative data about proliferation and growth, elongation, branching, tubulogenesis and differentiation. It is also possible to use transgenic or knockout tissues to establish organ cultures or carry out faster gain- and loss-of-function experiments in explants, for instance through lentivirus transduction or morpholino oligonucleotides, respectively (data not shown). All these approaches would allow real-time studies of mutant phenotypes and further understanding of gene regulatory networks in the developing pancreas. Research in the Spagnoli lab. is funded by the Helmholtz Association, FP7-IRG-2008-ENDOPANC grant and ERC-2009-Starting HEPATOPANCREATIC Grant. Slack, J. Developmental biology of the pancreas. Development. 121, 1569-1580 (1995). Pan, F., Wright, C. Pancreas organogenesis: from bud to plexus to gland. Dev. Dyn. 240, 530-565 (2011). Puri, S., Hebrok, M. Cellular Plasticity within the Pancreas- Lessons Learned from Development. Developmental Cell. 18, 342-356 (2010). Spagnoli, F. M. From endoderm to pancreas: a multistep journey. Cell. Mol. Life Sci. 64, 2378-2390 (2007). Hick, A. -C. Mechanism of primitive duct formation in the pancreas and submandibular glands: a role for SDF-1. BMC Dev. Biol. 9, 1-17 (2009). Villasenor, A., Chong, D., Henkemeyer, M., Cleaver, O. Epithelial dynamics of pancreatic branching morphogenesis. Development. 137, 4295-4305 (2010). Kesavan, G. Cdc42-Mediated Tubulogenesis Controls Cell Specification. Cell. 139, 791-801 (2009). Zhou, Q. A Multipotent Progenitor Domain Guides Pancreatic Organogenesis. Developmental Cell. 13, 103-114 (2007). Percival, A., Slack, J. Analysis of pancreatic development using a cell lineage label. Exp. Cell Res. 247, 123-132 (1999). Miralles, F., Czernichow, P., Ozaki, K., Itoh, N., Scharfmann, R. Signaling through fibroblast growth factor receptor 2b plays a key role in the development of the exocrine pancreas. Proc. Natl. Acad. Sci. U.S.A. 96, 6267-6272 (1999). Puri, S., Hebrok, M. Dynamics of embryonic pancreas development using real-time imaging. Dev. Biol. 306, 82-93 (2007). Magenheim, J. Blood vessels restrain pancreas branching, differentiation and growth. Development. 138, 4743-4752 (2011). Nagy, A., Gertsenstein, M., Vintersten, K., Behringer, R. Manipulating the Mouse Embryo: A Laboratory Manual. Third Edition, Cold Spring Harbor Laboratory Press. (2003). Horb, L. D., Slack, J. M. Role of cell division in branching morphogenesis and differentiation of the embryonic pancreas. Int. J. Dev. Biol. 44, 791-796 (2000). Muzumdar, M., Tasic, B., Miyamichi, K., Li, L., Luo, L. A global double-fluorescent Cre reporter mouse. Genesis. 45, 593-605 (2007).